Yesterday I had my first experience trying to establish a connection between my Laptop screen and the screen of the Sharp TV of a client. For some time now I have not been around the World Wide Web, and this may be as a result of not being able to meet up some online gigs. Hope you guys never missed me though. Winks! Sorry for the distraction, Hmmmmm! What was I talking about? Wait a minute! Let me think! Tick Tuck, Tick Tuck, Tick Tuck. Okkkkkkkkk. I got it. I was talking about how to share a laptop screen with a projector or an LCD/LED Television set. A client of mine who I got some electronics for some few weeks back came complaining of not being able to watch his laptop screen via his TV screen. He had fulfilled all set ups but to no avail “He claimed.” His conversation got me worried and I had to get my head re-examined. Several questions came through my mind. I bombarded him with questions like; “Are you certain the VGA connector is functioning”? “Was it properly fixed to the VGA port on the TV”? And some other questions followed too. All replies gotten confirmed that this client has done everything perfectly. Feeling geeky, I had to take a slow walk to the house of my client to confirm if he had actually done everything correctly. I confirmed functionality of VGA, checked for broken parts, and inspected cable for loosed pins or scrolls. From my physical analysis, all seems to be ok. I connected this same VGA cable to a system and it was confirmed working. At this point, I had few things on my mind and these were; could it be that the VGA port of this TV is bad or what? “I asked my self in a low tone.” Eventually, an idea rolled in my head and this was how I was able to make this laptop screen display on my TV. 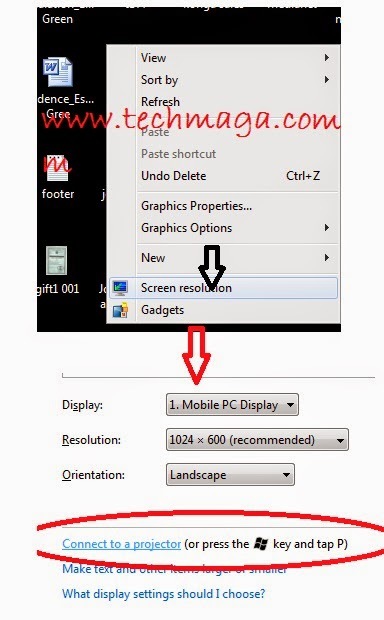 Select “Extend” (Windows 7 Users) or extend screen (Windows 8 Users). Click Apply and Ok your setup. If there is still no display, unplug and plug your VGA cable into the port. You should see your screen on your projector or Tv. Have you got similar experience, I recommend that you leave a comment about your experience. This will help me improve on the quality of this post. You can speak your mind via the comment box provided below this post. Yea. Ever since i had that big screen, opting in for a smaller screen was becoming irritating. Is nice to make use of a bigger screen you know. The laptop must have graphics to connect to the monitor or VGA is also enough. Really great experience if we use two screen while gaming. The projectors for home theater generally have values between 700 and 2,500 lumens, perfect for dark rooms or lighting. Search lumens projectors with higher values if you plan to use the projector in well-lit rooms..